Thread count is measured by counting the number of threads contained in one square inch of fabric, including both the length (warp) and width (weft) threads. The thread count is the number of threads counted along two sides (up and across) of the square inch, added together. Thread count is a measurement of the coarseness or fineness of a fabric. Thread count is often used as a measure of fabric quality, so that “standard” cotton thread counts are around 150 while good-quality sheets start at 180. Some, but not all, of the extremely high thread counts (typically over 500) tend to be misleading as they usually count the individual threads in “plied” yarns (a yarn that is made by twisting together multiple finer threads). For this reason, a fabric with 250 two-ply yarns in both the vertical and horizontal direction could have the component threads counted to a 1000 thread count. However, the National Textile Association (NTA), which cites the international standards group ASTM, accepted industry practice is to count each thread as one, even threads spun as two- or three-ply yarn. 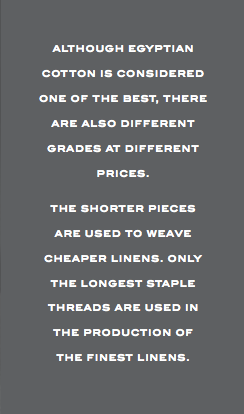 This is why Quagliotti states a thread count of 300 for their high quality linens, counting the threads in a correct way. 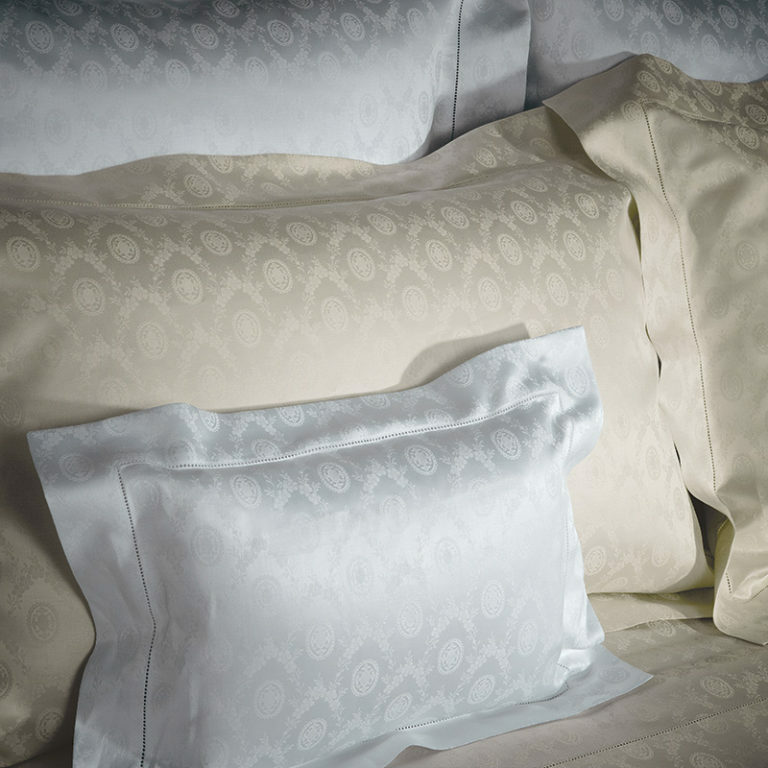 Cotton sateen sheets are lustrous and smooth, with a luminous sheen. Sateen weave adds lustre and drape for a soft silky hand. Cotton Percale sheets are plain in weave and characterised by a matte finish and crisp hand. 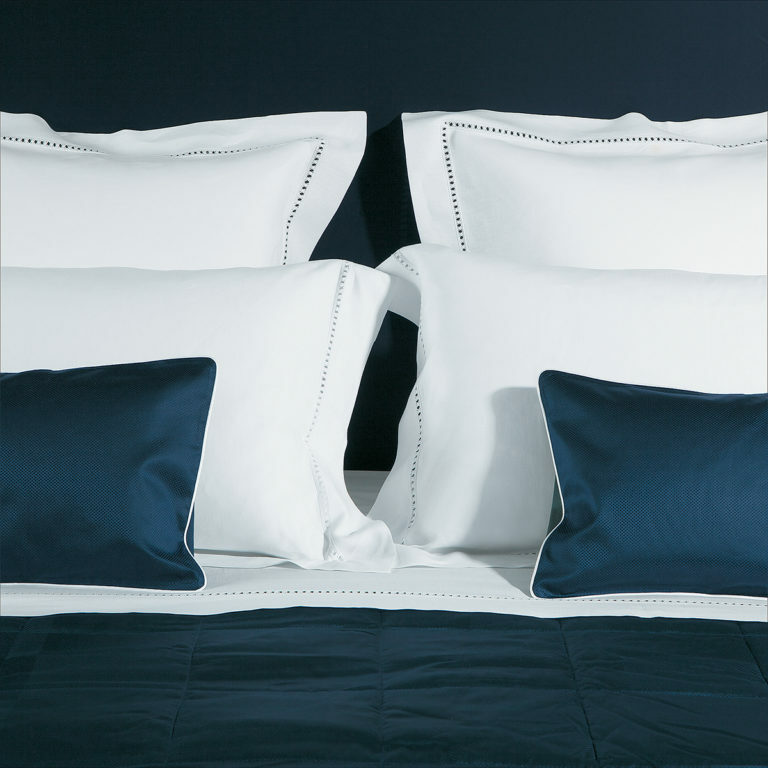 Mako is the nest Quality Extra Long Staple Egyptian cotton. Mako spins into smoother, finer and stronger yarns than any other cotton in the world. 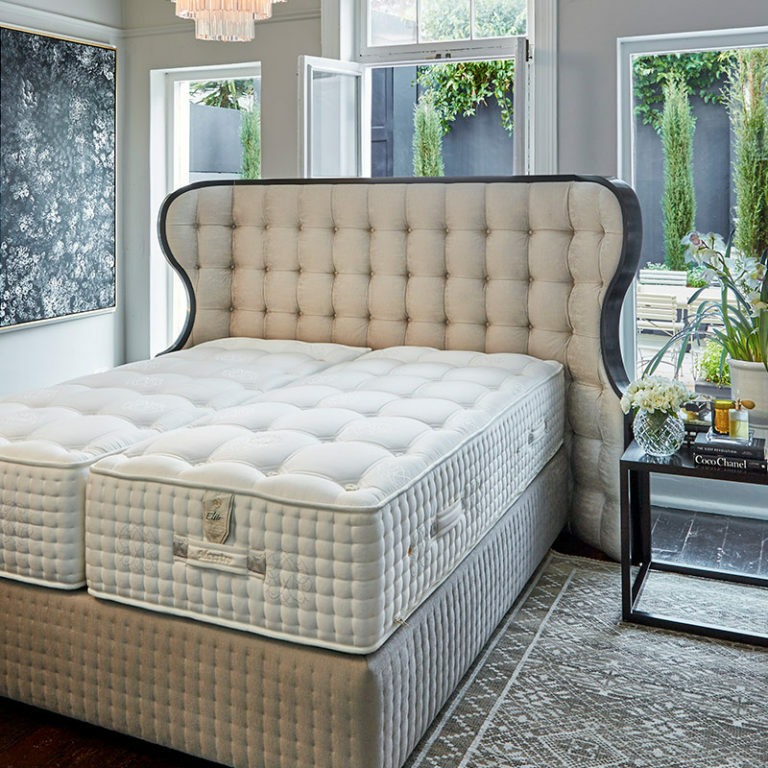 It is only possible with this quality of yarn, to achieve a true high thread count sateen that is soft, lightweight and breathes well and yet durable and able to withstand frequent washings. Mako cotton crops are cultivated in a tiny area east of the Nile delta and represent 0.5% of the total annual Egyptian cotton production. Cotton is picked by hand so only the flocks that are at the right stage of maturity are picked each time. The care taken with cultivating and manually picking the cotton avoids the use of defoliants and other chemical products commonly used with mechanised picking. Mako cotton fibres are extremely long (36 mm). But what really makes this cotton exceptional is the fineness of its fibres, measured in microns, which is between 3.0 and 3.2, and the degree of brightness equal to 74.8, the best among the Extra Long Staple cottons. The unique features of brilliance, resistance, cleanliness and regularity of Mako Cotton fibres allow the creation of fine-textured, lustrous yarns with a higher tensile strength, ready to be woven into luxurious high thread count fabrics. 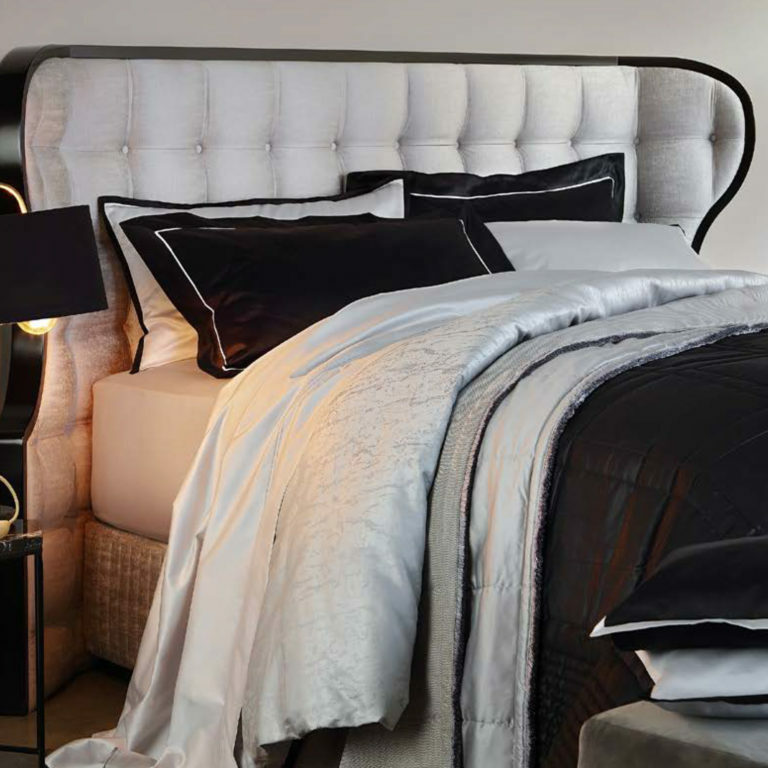 Sheets made of these fine fabrics are extraordinarily soft with a silky hand, rich drape and a luminous sheen. They are also stronger, more durable and much less likely to pill with washing.